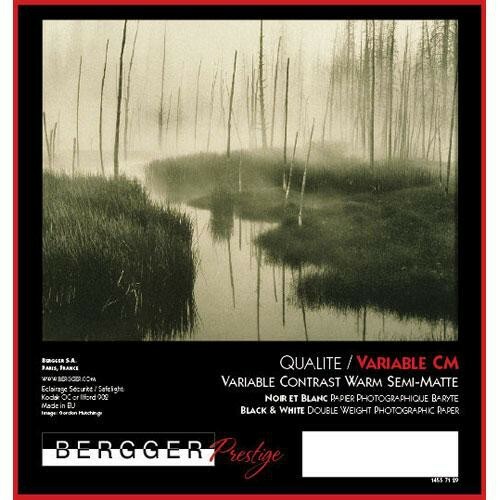 Prestige Variable CM from Bergger is a warmtone chlorobromide fiber based paper with a semi-matte surface finish, and is designed for traditional black and white printing and enlarging. Featuring a baryta-coated double-weight, 280 gsm white base, this polycontrast paper uses both green and blue chromatic sensitizers to deliver six full grades of contrast along with a high Dmax and rich, warm black tones. This item is one box of 25 sheets of 8 x 10" semi-matte paper. Box Dimensions (LxWxH) 10.95 x 9.25 x 0.7"
Prestige Variable CM Warmtone Baryta Paper (Semi-Matte, 8 x 10", 25 Sheets) is rated 4.7 out of 5 by 3. Rated 5 out of 5 by Hiernst from Beautiful Paper I was looking to find a slightly warm tone paper, but something that wasn't ivory or cream. This paper is beautiful, with dark blacks, mild warm mid-tones, and good whites. All around great paper and worth the higher price. Rated 4 out of 5 by Anonymous from Berger warm tone variable contrast fiber I am using this paper in class to see what it can do different than RC paper.the results are interesting although with Infrared negatives the exposure is a little longer. Not a negative the on line info from the manufacturer was helpful with basic guidelines on exposure, toning etc.. Although due to the expense of the paper you choose wisely in what you print. I like it!